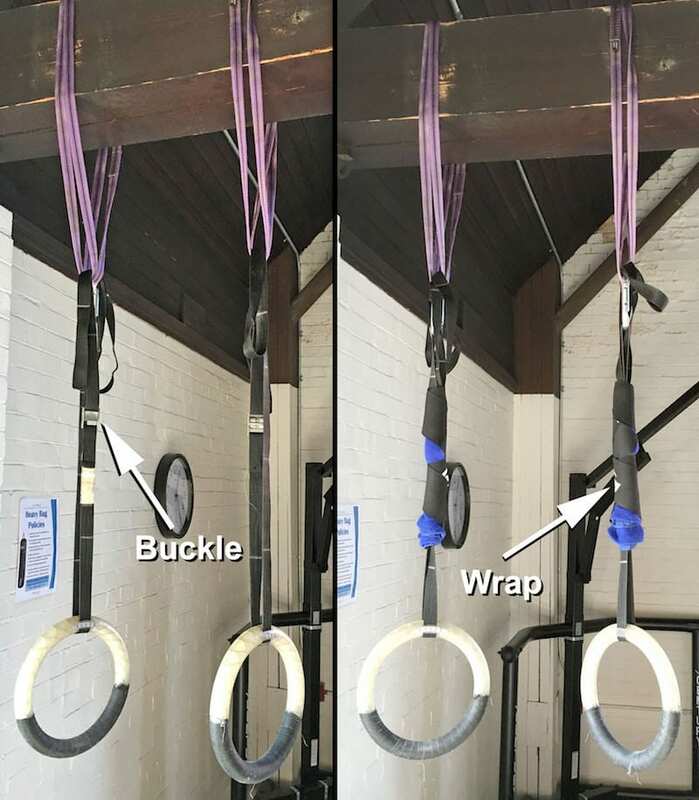 Rings usually come with very long (18′) straps for hanging them permanently from a high gym ceiling. The 8′ lashing straps are lighter and much more manageable. Just remove the old ones and replace them with the new ones. Before you do that, however, use the tape measure and the metallic silver permanent marker to mark lines on the straps in 6″ increments. This allows you to easily adjust the rings to the same height. You don’t need to label these as 4′, 4.5′, 5′, etc. because you can get them very close to one another just by eyeballing them. The lines are there so you can align them exactly. Setting up the rings is pretty straightforward. You just loop each sling over something like a pull-up bar, clip the carabiner through its two ends, and then attach the rings to the carabiner (see photo above). Once the rings are attached, you can adjust their height with the cam buckles. This setup is great for doing ring dips, ring rows, and potentially ring push-ups (if your support isn’t too high or too thick). If it is, then you will need longer slings. You’ll also need longer slings if you want to do muscle-ups. If you’re not familiar with a muscle-up, it is a ring pull-up followed by a ring dip (sort of). Ideally that means using rings that are above your head. I don’t have that kind of clearance at my gym, and I don’t even come close to having it at home, so I have to do muscle-ups from a kneeling position. It isn’t ideal, but it works. For higher (or thicker) supports, you should purchase a longer pair of climbing slings. 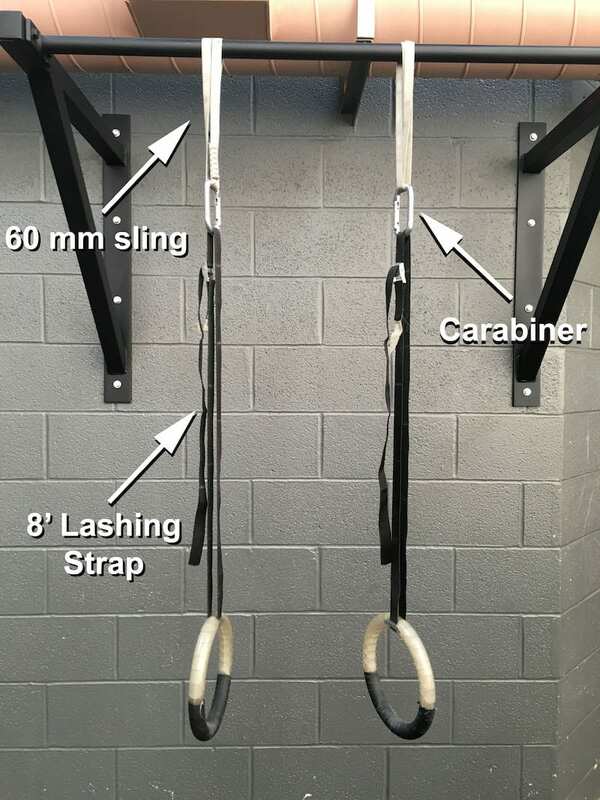 I use a set that is 120 cm long when I want to do muscle ups at my gym because they have to go around a ceiling beam on the second floor (see below). The only problem with this setup is that the cam buckles end up close to the rings, which means they rub against my upper arm at the top of a muscle up. I am still looking for a good solution to this. The OK solution I have come up with is covering each buckle with a Dura*Soft Knee Wrap, since I had two of them handy. I am sure there is a better alternative out there; I just haven’t found it yet. If you have a great idea, please send me an email.